I started my consulting company in 1990 to help food service operators with financial troubles. Finding it difficult to get paid, I started looking for work with companies in better shape. I ran into a local consultant, Bob Kaiser, who said I should work with computers since I had a background in accounting and technology. My first assignment was with one of Bob's clients. This company had two catering facilities and used Eatec software. The chef had zero success building recipes despite purchasing the The Professional Chef and the Food for Fifty (12th Edition) modules. These add on modules were a huge time killer. I found myself gutting sophisticated recipes for chicken, beef and vegetable stocks and replacing the classic recipes with a package of soup base and a gallon of water. After hours of wasted time, I completely destroyed the chef's preliminary efforts and built the recipes from scratch. 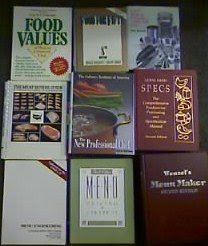 I used the Professional Chef book's approach and started with Mise en Place and Stocks. Then I progressed to Soups and Sauces before starting work on entrees. After a week, I had all the major protein work done. The vegetables, starches, breakfast items, baked goods and desserts went much quicker. During the project, my wife and I began to refer to this gig as "The $4,000 Mistake" since it consumed over 200 hours and 3 round trips (300 miles each trip) to finish. The Food For Fifty book has a fantastic first chapter which is a must read for anyone trying this exercise for the first time. They focus on quantity food service and use the perspective of a caterer or institutional food service operator. Recipes all yield 50 portions. I took many of the chef's clippings from Bon Appetit and Gourmet and converted them to the 50 portion yield. Before you start a project on a recipe costing program, you need to be very well organized. Create an outline. Take the most complex recipe and imagine you are building the database. You will find you need to stop work and create other sub-recipes first since you can't purchase many of the stocks, sauces, mixes and blends called for in the recipe. Each of these components requires a recipe. These individual components called for by the complex recipes are the building blocks of a successful recipe model. I am a Catering consultant in the UK and am just having a look at some of the available browser based/apps for recipe costing. My client needs to be able to manage stock using the same process to avoid duplication. Have you come across this type of functionality? To my mind you have to make it really easy to keep product/ingredient prices up to date to maintain the currency of the info but some of the stuff I have seen will not allow customer upload of a ingredient file. Interesting blog - will keep an eye on it. Most of the web-based solutions will allow an initial upload of the ingredient list with plenty of ingredient specific data: Item Name, Category, Purchase Unit, Inventory Unit, Usage Unit, unit conversion factors, Primary Storage Area, Primary Supplier, Barcode, Supplier Code, Cost Per Purchase Unit. Keeping data fresh is a matter of using the excellent purchasing tools. At a minimum, users can import current prices from online vendor ordering systems. They need to order 1 purchase unit for each item and enter null inventory counts to update recipe costs. I recommend putting the purchasing tools to full use and entering line item details of all invoices. People who have never invested in this effort simply can't imagine the tremendous benefit. These users don't have to do any "tricks" since all recipes will be re-costed automatically from the purchase data.